A fresh and lovely style, this floral-print short graduation dress has the look of springtime in soft crepe fabric. 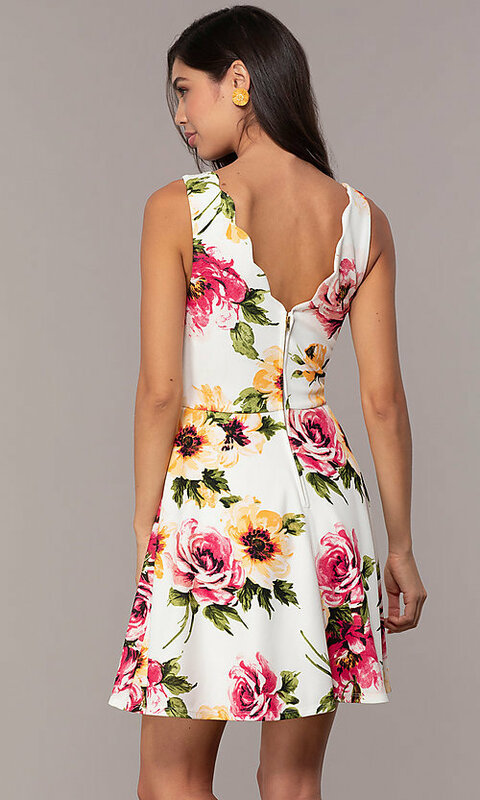 Yellow and magenta flowers bloom across an ivory white background on the delightful party dress that can be worn for casual walks on the boardwalk or even to semi-formal events. Scalloped trim adds a lovely detail to the v-neckline and deep v-back of this adorable summer dress. The short a-line skirt flatters the figure and completes the look of this floral-print short graduation dress that would be equally appropriate at the Derby as on a cruise.